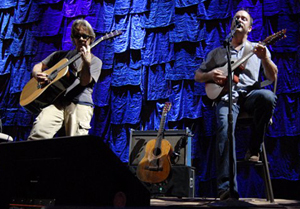 Right after Dave Matthews Band makes a stop in Alpine Valley, Dave Matthews and Tim Reynolds will be making a pit stop to perform at the Constellation Brands - Marvin Sands Performing Arts Center in Canandaigua, NY on July 6th, 2010. Warehouse members can request tickets now for this event until Monday, June 7th at 12:00 pm noon ET. Public sale for tickets will begin on Friday June 11th at 10:00am ET. VIP Packages will also be available to Warehouse members. VIP Packages include your concert ticket with a prime view of the stage, a souvenir laminate and access to a complimentary PRESHOW dinner buffet. The cost per VIP Package per person is $275.00 plus applicable convenience and handling fees - members may request up to 4 regular priced tickets and 4 VIP Packages for each show.